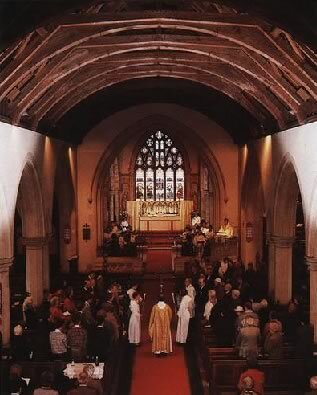 The body of the Church is remarkable for its width and is one of the five widest to be found in England and Wales. During Street's restoration (1872 - 1874), box pews were removed from the Nave and the Nave arches and roof raised. A Singing Gallery, installed above the Chancel steps earlier in the 19th Century, was removed. The Chancel is where the ministers and choir sit and from where the services are led. The choir stalls in St Oswald's, like the pews, date from around 1872.